Recently, I have become interested in the adventure genre again, chiefly with titles like Beneath a Steel Sky, the Space Quest franchise, Grim Fandango, and The Neverhood, as well as more recent adventure games; I've specifically been into The Wolf Among Us and Telltale’s The Walking Dead. This is a genre I usually stay away from, due to some rather finicky design issues that I have a distaste for in certain adventure games. The genre was essentially dead until a couple of game designers and developers decided to slowly resurrect it with a fresh new look and design. Adventure games have definitely had an interesting history in popularity. They were the “unique” games of their time before we had a slew of indie developers and Kickstarter projects publishing unique games. I'll provide a little cliffNotes history of the companies that were the most well-known for making adventure games, talk about what I like and dislike about the genre, and explain what I think needs to change. Back in the day, games were very simple when the arcade and home consoles were available to the public. There wasn’t really anything complex about the games themselves. All you did was perform a certain action, like platforming, shooting, or gaining points, and hope to get the highest score you could. It was a simpler time back then. The adventure genre began in the ‘70s as text-based adventures, in which you typed in commands in order to progress through the story. These kinds of games were made famous by companies like Infocom, and they are not my cup of tea. I don’t care for games that are only text-based, and, on top of this, games where you have items packaged with the game in order to get you immersed in that game’s world. Luckily, in 1979, a company known as Sierra Entertainment surfaced, and they decided to be more innovative with their adventure games by actually using graphical images in them. Sierra Entertainment was mostly well-known during the '80s until the late '90s for their titles like King’s Quest, Space Quest, Leisure Suit Larry, Gabriel Knight, Quest of Glory, and so on. The games themselves were known for a variety of things; the Space Quest series was known for its humor, and the Kings Quest games were known for being brutally difficult and somewhat unfriendly to gamers, but they were popular nonetheless. In the '80s up until the late '90s, LucasArts, the company owned by none other than George Lucas, decided to throw their hat in the ring by developing some of their own games. Let’s just say that their attempt at making adventure games got them to be one of the most popular game developers around at the time. They were known for games like Maniac Mansion, Day of the Tentacle, the Monkey Island series, Full Throttle, Sam and Max, Grim Fandango, The Dig, and many others. These games also got highly praised for being extremely funny, but why is the humor one of reasons these games stand out among adventure titles? It’s chiefly because they hired two of the best game designers around at the time, who were making and writing most of the adventure games listed above. The two designers in question are Tim Schaeffer and Ron Gilbert, who are extremely creative and know their way around humor. You may recognize them for more recent games like Deathspank, Brutal Legend, Stacking, and The Cave. During the ‘90s, another company called Cyan released a series of games called Myst, which were well known for being a first-person 3D adventure game. Sadly, at the tail end of the ‘90s, adventure games pretty much died as they stopped raking in huge sales, and games like The Neverhood and Grim Fandango became very difficult to find. For a while, adventure games popped up from time to time, but they were not a popular genre while action games, shooters, and platformers conquered the home consoles and computers. They remained dormant until the mid-2000s, which is when two companies in particular were doing rather interesting things with the adventure genre. Quantic Dream released Indigo Prophecy, a horror/cinematic adventure game with a morale system and multiple endings, which was very well-received. It is a game I definitely recommend checking out. The other company was Telltale Games, founded by ex-LucasArt employees, that got well known for their work on the newer Sam and Max games, a Monkey Island game, a game based off of Back to the Future, Jurassic Park, and The Walking Dead. The last one I mentioned won multiple Game of the Year awards, and it is one of my personal favorite games of all time. They are also known for an adventure game based around Wallace and Gromit, as well as their recent release of The Wolf Among Us, which is based off of the comic book series Fables. Recently, the adventure game genre has gotten a bit of a face lift, and it has starkly reappeared in the gaming industry. Even Kickstarter is helping out designers with games like Double Fine Production’s Broken Age (which I, personally, am looking forward to), and Doug TenNapel’s Armikrog being fully funded. Both are set to be released sometime in the future. So, what do I enjoy about adventure games? I enjoy the stories, the worlds, and the characters that come out of these kinds of games. I know a lot of people prefer gameplay over story, but with adventure games, if the world, story, and characters are not interesting, then you are merely walking around a boring world with forgettable characters, doing little but solving puzzles. Since story and characters are basically 50% or more of the focus in adventure games, developers can and should use most of the manpower they have to come up with a clever world and characters. This is where designers like Tim Schaeffer and Ron Gilbert really show off their strengths. I’ll list a few games and explain what I mean. In Toonstruck, you are a cartoonist played by Christopher Lloyd who gets sucked into a cartoon world being threatened by a malicious villain played by Tim Curry. The Neverhood is a huge clay-made world, filled with surreal humor, as well as a story that bears the biblical theme of creationism. Leisure Suit Larry in the Land of the Lounge Lizards is a comedy about a dorky guy whose only goal is to get laid. Blazing Dragons is a world with centaur-like dragons that are protecting the land from a villain played by Cheech Marin. What I'm getting at is this: if you cannot have fun or do well in creating a world using those premises, then you've done something wrong. You could even create far more adult-themed stories and worlds like in Sanitarium, Dark Seed, or I Have No Mouth and I Must Scream. I know there are gamers who also play adventure games for the puzzles, but the stories, characters, and settings are the things that I look at in an adventure game first. The puzzles have always been a mixed bag for me, but I usually prefer inventory puzzles, since 50% of the logic puzzles that I've played have left me stumped enough to look up a walkthrough. So, what do I think needs to change about adventure games and what do I hate about them? To put it simply, adventure games can be extremely unfriendly to gamers. Some adventure games are known for being brutally difficult for the reason of extending the game’s life span. Many tactics for making legendarily difficult adventure games have been used in the past, such as incorporating inventory items that can kill the player, creating unbeatable scenarios for the player to stumble upon, or adding puzzles that are completely cumbersome lest the player happens to be some adventure game god. Many adventure games simply adored messing with the player. I am all for games increasing in difficulty, but the adventure game tropes I listed above have always made me want to stop playing any game that featured them. I don’t feel rewarded after getting past something like the infamous Space Quest IV Skate-O-Rama section, but rather feel annoyed and exhausted that I spent hours or more on one section of the game that killed the pacing and enjoyment of the experience. Thank goodness we have patching available in gaming these days, or else stuff like this wouldn’t fly. 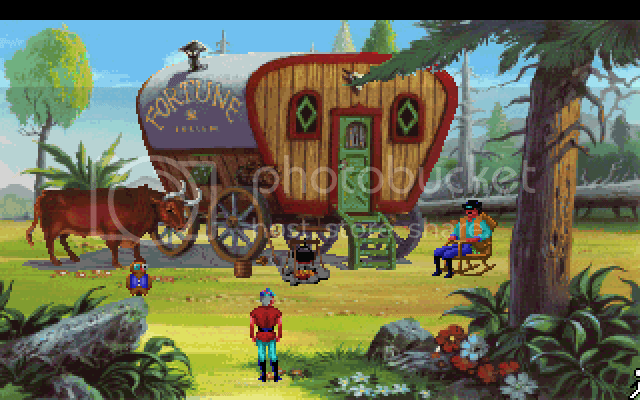 There is a fine line between being difficult and being obnoxiously tedious, and a lot of game series like Kings Quest fell into the latter category, which is why I prefer the adventure games from LucasArts. Sure, LucasArts adventure games have their tedious moments, but they are never talked about as much as Sierra Entertainment adventure games. Adventure games also had the tendency to screw with the player simply for the sake of it, like the infamous hallway segment in The Neverhood. Let us not forget the trope of a game not telling you how or when you have messed up resulting in the player forcing to restart to the very beginning like in The Adventures of Willy Beamish. I don’t need everything hand-fed to me to beat the game, but I want to feel like I messed up because at least I know I've made a mistake – don’t tell me that I messed up when I did that one thing wrong seven hours back. Outlandish logic might make sense in games like Sam and Max or in Toonstruck, but it can’t be too headache-inducing; otherwise, people who aren’t dedicated gamers of the genre won’t want to play it anymore. In my opinion, adventure games need to be fluid experiences, and they can’t rely on illogical tropes to make their games creative. I know the appeal of these kinds of games is that if you stay dedicated, you will pull through and beat the game, but what if I just want to have fun in this game’s world? What if I want to feel enveloped in a game’s reality without having to worry about using which item when or where, or having to really think outside the box to solve a very minor puzzle? Overall, adventure games are an interesting genre to talk about, since you can do a lot of things with them. It's interesting that we are seeing a bit of a revival of the genre thanks to companies like Quantic Dream and Telltale, along with companies like Kickstarter who assist in funding designers like Doug TeNapel and Tim Schaeffer. On the plus side, this also provides the gaming industry with a bit more variety, which is one thing gamers are constantly asking for in a flood of shooters, RPGs, and action games. Maybe we will see more adventure games made by classic developers, and hopefully, see some sequels (or even spiritual successors) to some of the legendary adventure titles in gaming.